Instructions on where to check-in upon arrival to campus will be sent to enrolled students through email in early June 2019. Check-in at 8:30 am on the first day of classes, Monday, June 17, 2019 in McCarthy Quad (see map below). Students will be escorted to Orientation. After Orientation students will be given their textbook(s) and escorted to class. Students should enter the University Park Campus through gate 3, which is located off of Figueroa Street and McCarthy Way. 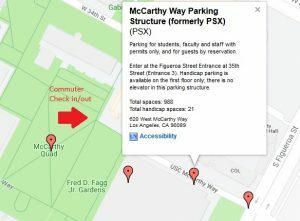 Parking will be available in the McCarthy Way Parking Structure for a daily fee. From the McCarthy Way Parking Structure, please follow the USC Summer Program signs to McCarthy Quad where our summer program staff will meet you. Orientation for all students will be held the morning of the first day of class, Monday, June 17, 2019. We will review specific program policies and answer any questions students may have. At the conclusion of the orientation, students will be escorted to their class.